Empire: Total War & Napoleon: Total War - Game Of The Year Edition Includes: Two full games - Empire: Total War & Napoleon: Total War All downloadable content for both titles Empire: Total War: The Warpath Campaign Expansion The Elite Units Of The West Pack The Elite Units Of America Pack The Elite Units Of The East Pack Napoleon: Total War The Peninsular Campaign Expansion The Coalition Battle Pack Comprising the award winning Empire: Total War and its dramatic sequel Napolean: Total War this Game of the Year edition covers over a century of epic wars and revolutions that shaped the world. 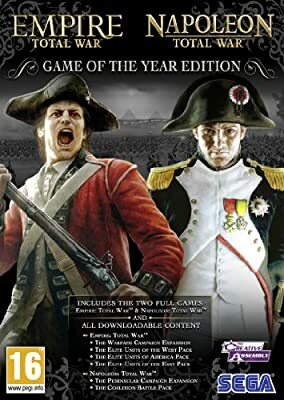 Empire and Napoleon Total War Collection Game of the Year PC. Brand New Factory Sealed in Retail DVD case by Sega UK. Platform: WinXP/Vista/7. PEGI: 16. Ship daily via USPS 1ST CLASS(4 - 7 Business days)w/FREE delivery confirmation & Shipment Notification. Minimum System Requirements: OS Windows XP/ Vista / 7 Processor 2GHz intel dual core CPU / 2.6GHz Intel single core CPU, or AMD equivalent Memory 1GB XP / 2GB Vista Hard drive 18GB free Video Card 256MB Direct x 9.0c compatible sharer model 2b System Requirements: Windows: XP/Vista/7 Processor: 2Ghz Intel dual core, 2.6 Ghz Intel single core or AMD equivalent RAM: 2GB Hard Drive Space: 18GB Please check software compatibility before purchased. NO OPENED BOX RETURN(Please read Amazon Software/Video game's return policy). 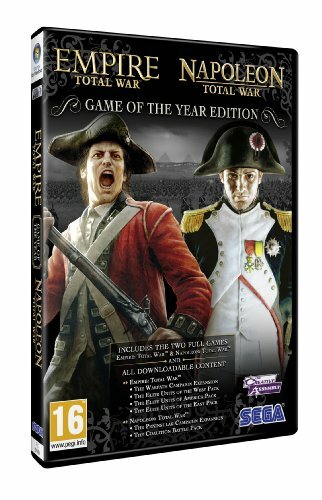 Empire: Total War & Napoleon: Total War - Game Of The Year Edition Includes: Two full games - Empire: Total War & Napoleon: Total War All downloadable content for both titles Empire: Total War: The Warpath Campaign Expansion The Elite Units Of The West Pack The Elite Units Of America Pack The Elite Units Of The East Pack Napoleon: Total War The Peninsular Campaign Expansion The Coalition Battle Pack Comprising the award winning Empire: Total War and its dramatic sequel Napolean: Total War this Game of the Year edition covers over a century of epic wars and revolutions that shaped the world.